A fun Dolphin themed water slide with a pool at the bottom! Perfect for a hot summer day to cool down. 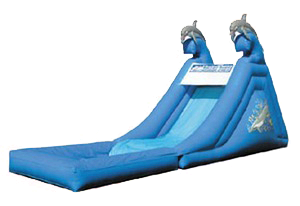 It features an inflatable safety ramp at the entrance to protect excited kids as they scramble to get inside. Recommend 3 kids at a time, one sliding, one climbing and one entering.